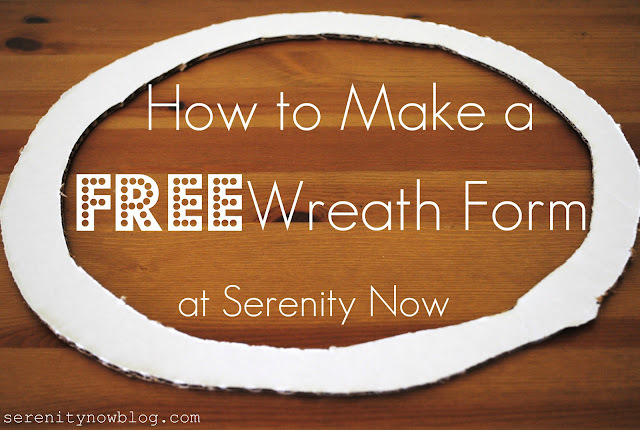 I'm going to show you how to make your own wreath form (for free!) today. 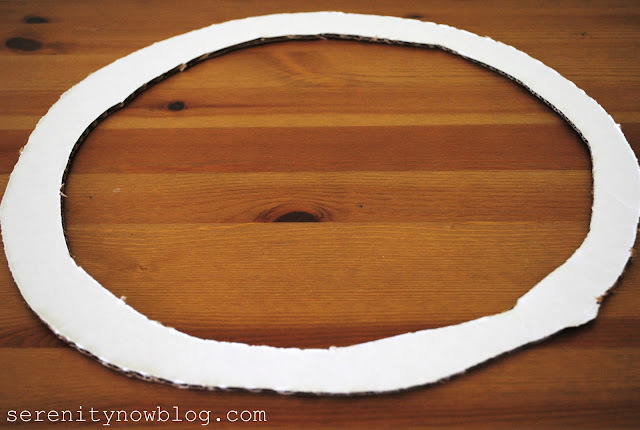 I've used this method a couple of times now, and I'll show you my most recent wreath tomorrow! It's not exactly beautiful, but it's free and it does the trick. Nothing stinks more than getting the itch to do something crafty and realizing that you don't have all of the supplies you need. 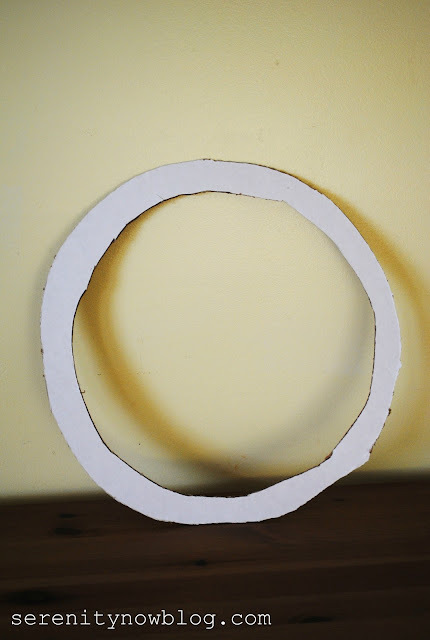 I've spent money on wreath forms before, but making my own using the steps I'll show you today costs zero dollars (the best amount to spend) and works great for wreaths that don't need a thick form. I chose a box with a white background (thank you Costco, for your awesome box pile by the check out!) so I wouldn't have to spray paint anything. Your color choice will depend on the type of project you're doing. Will brown cardboard show through? 1. Turn the box/box lid upside down and trace your larger bowl/circle in the center. 2. Trace a smaller circle in the middle of the first large circle. *The size should depend on how wide you want your form to be. I needed something very thin, so I chose two bowls close in size. 3. Carefully cut out the center of your circle first. 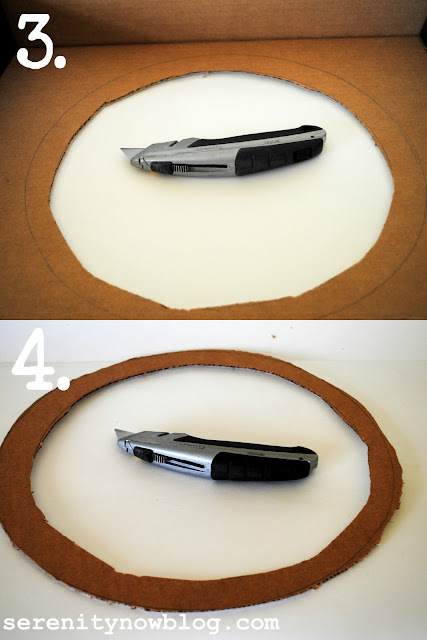 I started with an x-acto knife, which did not work at all because the cardboard was much too thick. I switched to T's box cutter (once I found it! ), and it did the trick! 4. Punch out the center and then use your box cutter to carefully cut the outer edge of the form. Now you have a wreath form--and it was free! The edges are kind of choppy, but I could afford imperfections with the project I had planned. 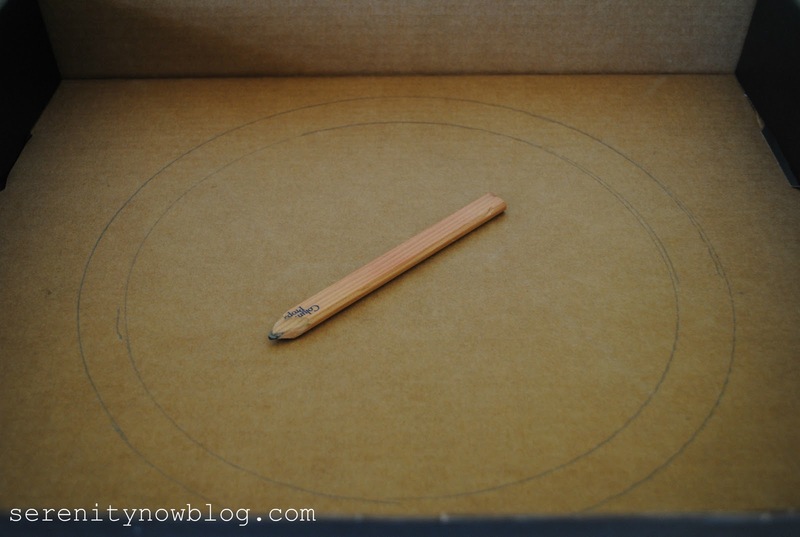 If you need clean lines, you'd want to take care with trimming the cardboard. No, not the most beautiful thing you'll ever see, but the point is that it's supposed to be covered up! Come back tomorrow to see what I made with my wreath form. 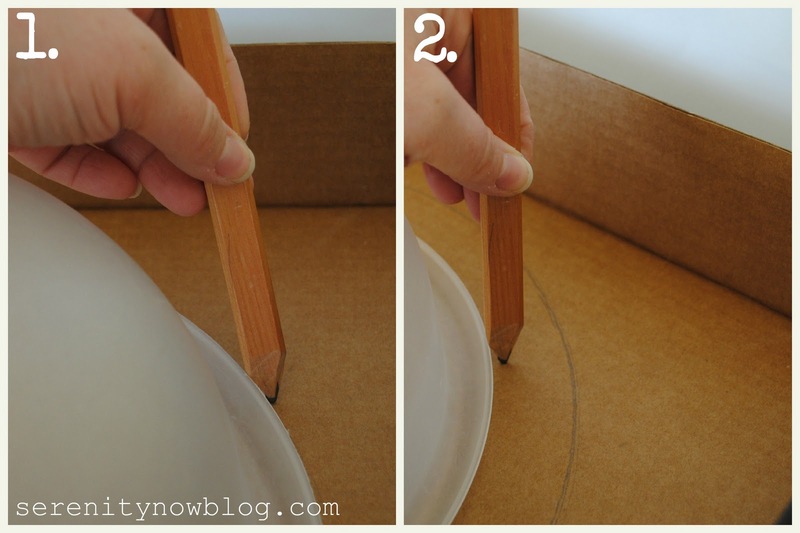 What's your favorite cost cutting measure when it comes to decorating or crafting? Free is always good! Now I'm regret recycling cardboard last weekend. My goal today is to come up with a V-day wreath without buying supplies. We'll see how that goes! This is such a great idea. I love all things free! I'm excited to see what your wreath looks like tomorrow. This will be great when I find some free time and make us a lovely new wreath. I can't wait to see what you make with it!! What a good idea, Amanda! I think this is the kind of thing our mothers and grandmothers used to do--back before there was a Hobby Lobby to run to, and when folks didn't have credit cards to use on unnecessary things. We'd do well to follow your example--good for us, good for our wallets, and good for the environment as well! You are so clever. And with all the cardboard I feel like I'm always throwing out, this should be a breeze. Excited to see your project. Yea!!! Clever-ness! thanks for sharing! Free is definitely the way to go!!! ;) I use my husband's old ropes as wreath forms. I don't cover them all the way up, it adds to the rustic look anyway. Great idea!! 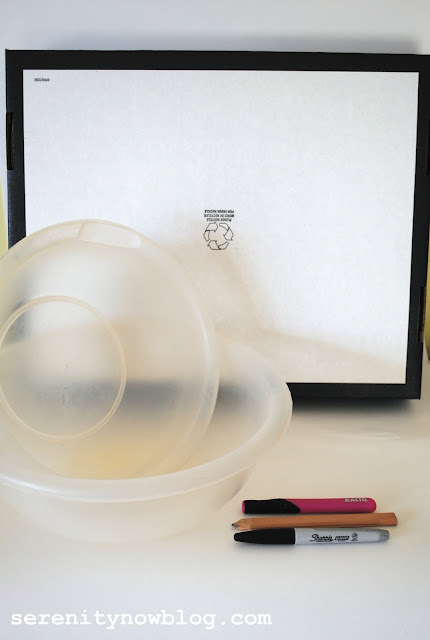 Never would have thought about using a box lid!! Cool! I am going to do this for a heart form too! Yeah for your great idea! I live in Portugal, and I don't think I've ever seen a wreath form here--just a few pre-decorated ones. This could reduce what I have to bring back from America. Thanks!!! That is such a great idea! My front door has been bare since I took down Christmas decorations. It won't be for long now! Thanks!